Obituary – Washburn, Dorothea “Hazel” (Young) « Perry High School Alumni Association, Inc.
Mrs. Pat (Hazel) Washburn, formerly of Perry, died shortly after being injured in a one car traffic accident about 3:30 p.m. Sunday near Roma, Texas. Services were pending Monday. Friends of the family here said burial will be in a Laredo, Texas, cemetery. Mrs. Washburn, about 62, had been making her home in Laredo. 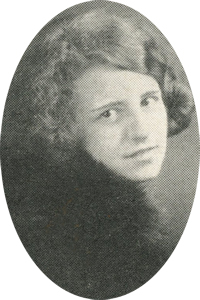 Mrs. Washburn was born in Noble county and grew up on a farm west of Perry. She was the daughter of the late John and Daisy Young, pioneer residents of Noble county. The Washburns moved from Perry to Laredo about two years ago. Survivors include a daughter, Mrs. Bob (Cheryl) Miller, Fort Worth, Texas; a son, Jimmy Washburn, a student at Central. State come, Edmond; and one granddaughter.